I read this article and found it very interesting, thought it might be something for you. The article is called Easter Egger Chickens and is located at https://www.chickencoopguides.com/breeds/easter-egger-chickens/. From the name alone, you can probably guess what’s special about Easter Egger chickens! So called for their gorgeous colored eggs, these medium-sized birds are easy to care for and have famously vibrant and friendly personalities, making them a solid choice for your first flock. What Is an Easter Egger? Easter Egger chickens are not actually a breed all their own. Rather, Easter Eggers are defined as any chicken that carries the “blue egg” gene but does not conform to any breed standards specified by the American Poultry Association. Usually they are mixed-breed birds that have some traces of the blue egg-laying Araucana or Ameraucana breeds in their ancestry. As a hybrid variety, these chickens come in a whole range of colors and patterns, making it easy for you to tell the individuals of your flock apart. A hardy variety with few health problems, Easter Egger chickens won’t pose a challenge for those who are just starting out with raising chickens. Their relatively small size allows them to tolerate heat well, while their small pea combs make them less susceptible to frostbite when living in colder climates. They usually do not have feathers on their legs, which makes them less likely to develop problems with their feet when conditions in the run are wet or muddy. Some birds may have feathery beards or muffs on their faces thanks to genes from their Ameraucana ancestors. Most frequently blue or green, Easter Egger eggs can range in color from olive to tan to brown to white. Sometimes the eggs can even be slightly pink! Looking up Easter Egger pictures is a great way to get an idea of the stunning range of shades these eggs can come in. Just keep in mind that each hen lays a single color. So if your hen starts out laying olive eggs, don’t expect pinks or blues in the nesting box the next day. In addition to being beautiful, eggs from these chickens are usually large or extra-large and are perfect for cooking and eating. Hens are quite productive, usually laying about four eggs per week. 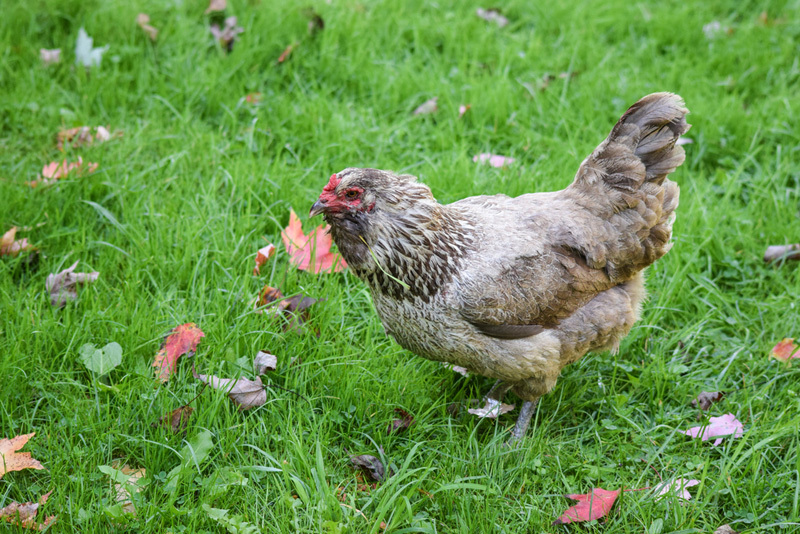 This docile breed is a great choice for anyone who wants to involve their kids in egg gathering and chicken care. In addition to the fun of colorful eggs, your children will love the friendly, gentle personalities of their new feathered friends. Easter Egger chickens are not usually shy and will happily approach humans, often entertaining their owners with their silly antics and curious exploring. Many birds enjoy following their owners around the coop or yard and will happily accept treats. Easter Egger chickens can be easily kept in the backyard. Though hardy and tolerant to temperature variations, they should nevertheless be kept in an insulated coop with no cold drafts to avoid excess stress and disease. Heating the coop is not necessary and in fact can negatively impact the health of your flock, as the chickens will not develop their natural ability to tolerate the cold. These active birds enjoy roaming and foraging, so including a chicken run in your coop will keep them healthy and happy. However, they also tolerate confinement well. If you are short on space, you may want to look into keeping bantam Easter Eggers. Just like standard Easter Eggers besides from their diminutive size, this variety can be kept in a smaller coop and will also save you money on feeding costs. Friendly, productive, and uncomplicated, these vivacious birds are a great fit for families who love eggs. Give your Easter Egger chickens a comfortable home and enjoy the benefits of fresh, beautiful eggs all year round.